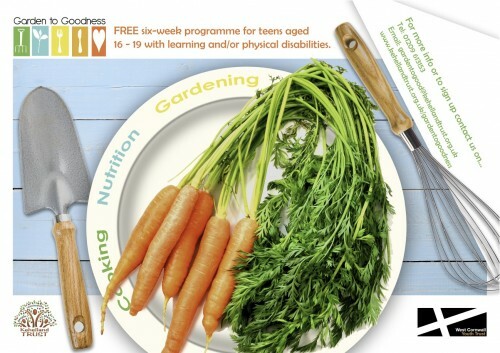 Our Garden to Goodness project provides educational workshops for 16-19 year olds with moderate learning and/or physical disabilities. Participants will be encouraged to make a distinct connection between the growth of fruit and vegetables and their culinary uses whilst gaining key knowledge and understanding about nutritional health benefits. It will be carried out over three, six week programmes and all sessions will have a practical and interactive focus, supported by activity worksheets and journals. “The concept of Garden To Goodness started to form following my nutrition studies at Plymouth University where I graduated as a dietitian. My enthusiasm for public health promotion was evident, focusing my attention on disadvantaged groups within the community volunteering with NHS Health Promotion Services and Kehelland Trust. My dissertation looked at children’s perceptions of fruit and vegetables, which provided me with more incentive to pursue healthy eating education. Prior to my nutrition studies I trained in horticulture and established my own gardening business both in the UK and Australia, where I originate from. Having developed a passion for growing, nutrition and cooking, the Garden To Goodness project naturally blossomed!” Monique Hyland, Kehelland Trust.